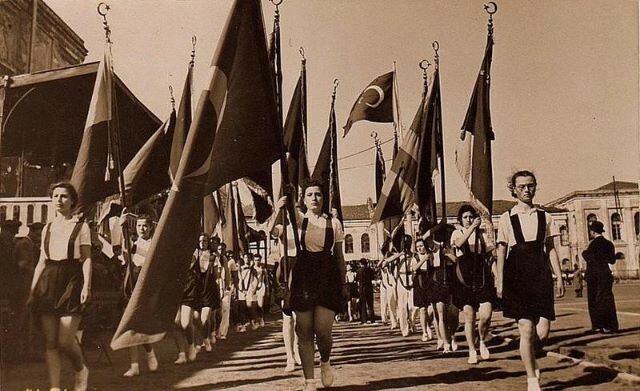 Flag parade commemorating Ataturk, Youth and Sports Day in 1939. May 19, 1919 marks the beginning of the Turkish War of National Liberation, a turning point in Turkey's history. On this day, a young Ottoman general, Mustafa Kemal, arrived in Samsun. The man, who would later be known to the world as Mustafa Kemal Ataturk, stepped ashore on this small Black Sea Coast town to embark on a journey that would ultimately create the Republic of Turkey and a new nation state. The Ottoman Empire at the time had been carved up as a result of its ill-fated decision to join World War I on the side of the Germans. The defeated Ottoman government signed the Mondros agreement with the Allied forces, securing its own existence, while relinquishing almost all of its territories, except for a small Anatolian heartland, to Britain, Italy, France and Greece. The Mondros agreement, designed to decimate the Ottoman nation, was being implemented step by step with the final insult to the Ottomans coming with the invasion of Izmir and violent advance into Anatolia by the Greek army. Civilian resistance began building up against the occupation, but without a sense of direction or coordination. Mustafa Kemal, whose public and military standing was solidified as the military commander who won the Ottoman victory in Gallipoli, was assigned the post of Inspector General of the Ottoman Armies to Anatolia. He immediately left Istanbul aboard an old steamer, arriving in Samsun on May 19, 1919. Mustafa Kemal dispatched his first report to the Ottoman Sultan on May 22, underlining that Turks would not accept foreign subjugation and longed for national sovereignty. This signaled the beginning of the national liberation struggle. Realizing that Samsun, already under British occupation and surrounded by Greek irregular forces, was no longer safe, Mustafa Kemal moved his staff to Havza, about 85 km inland, on May 25. In Havza, Ataturk’s historic mission unfolded. He dispatched telegrams to local resistance organizations all over Anatolia to organize mass demonstrations protesting the occupation and to inform the public about the gravity of the situation. Demonstrations followed across the country. Several leading Ottoman army generals and their troops joined Mustafa Kemal and signed the Declaration of Amasya on June 22, 1919, declaring that the unity of the country and the liberty of the people were in danger, that the Istanbul government was inept to save the nation and that “the liberty of the nation was to be saved by the nation’s own perseverance and will.” This declaration included the first signs of Ataturk’s vision of national sovereignty and democratic rule for the Turkish people. Mustafa Kemal took the leadership in convening two national congresses with representatives from all over the Empire in Erzurum and Sivas, followed by the forming of a national parliament in Ankara on April 23, 1920. He was elected as Commander in Chief and organized the remaining Ottoman forces, as well as irregular forces under the Ankara government’s central command, creating a new army that eventually defeated the occupying forces. The Turkish War of Liberation lasted four years and culminated in the international recognition of Turkey’s borders through the treaty of Lausanne on July 24, 1923 and the founding of the Republic of Turkey on October 29, 1923. Ataturk later declared May 19 as a national holiday dedicated to Turkish youth and sports. The holiday continues to be celebrated today in Turkey as Ataturk Remembrance, Youth and Sports Day.